I’ve decided to write a post about Steampunk books that are still on my TBR list, today! This fortnight ends tomorrow and I was planning on doing a wrap-up post then, and I’m nowhere near the end of a Steampunk book to review tonight. So, what Steampunk fiction have I still got to read? 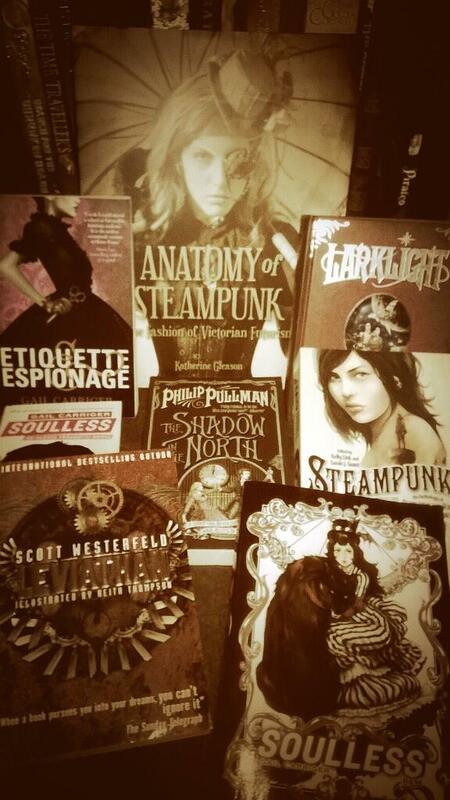 Anatomy of Steampunk, Soulless, Soulless: The Manga, Steampunk!, Leviathan, The Shadow in the North, and Larklight. Larklight by Philip Reeve – Goodreads Synopsis: Art, Myrtle and their mother accept the kind invitation of a holiday to an up-and-coming asteroid resort. But they set out with visions of rest and relaxation only to be sucked into a dastardly plot involving spies, time travel, and mind-altering clothing! Before their adventures are out, they’ll sail an aether-ship amid asteroid-strewn seas, dodge demonic puppets, and learn wisdom from an unlikely ally: the Moobs! With faster-than-light plot twists and enough tongue-in-cheek vim and vigor to keep a galaxy in laughter, this dynamic sequel to Larklight is a tour de force of the most intergalactic kind. As you probably saw from my review, I LOVED Larklight, the first in this series! 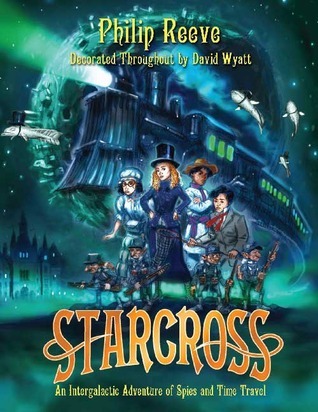 I bought it and the sequel together, so I still have this, Starcross, to read. I’m really excited for it! 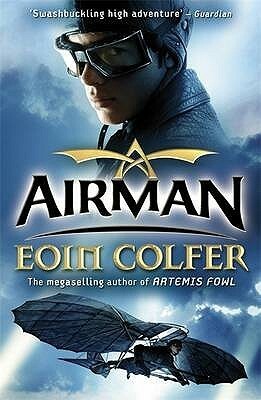 Airman by Eoin Colfer – Goodreads Synopsis: Conor Broekhart was born to fly. It is the 1890s, and Conor and his family live on the sovereign Saltee Islands, off the Irish coast. Conor spends his days studying the science of flight with his tutor and exploring the castle with the king’s daughter, Princess Isabella. But the boy’s idyllic life changes forever the day he discovers a deadly conspiracy against the king. When Conor intervenes, he is branded a traitor and thrown into jail on the prison island of Little Saltee. There, he has to fight for his life, as he and the other prisoners are forced to mine for diamonds in inhumane conditions. There is only one way to escape Little Saltee, and that is to fly. So Conor passes the solitary months by scratching drawings of flying machines into the prison walls. The months turn into years, but eventually the day comes when Conor must find the courage to trust his revolutionary designs and take to the skies. Airman looks awesome! I can remember reading Artemis Fowl when I was smaller and loving it, so I’m looking forward to reading a steampunk book by Eoin. 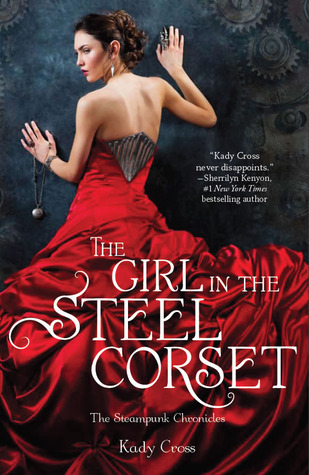 The Girl in the Steel Corset by Kady Cross – Goodreads Synopsis: In 1897 England, sixteen-year-old Finley Jayne has no one…except the “thing” inside her.When a young lord tries to take advantage of Finley, she fights back. And wins. But no “normal” Victorian girl has a darker side that makes her capable of knocking out a full-grown man with one punch…. Only Griffin King sees the magical darkness inside her that says she’s special, says she’s one of “them.” The orphaned duke takes her in from the gaslit streets against the wishes of his band of misfits: Emily, who has her own special abilities and an unrequited love for Sam, who is part robot; and Jasper, an American cowboy with a shadowy secret. Griffin’s investigating a criminal called The Machinist, the mastermind behind several recent crimes by automatons. Finley thinks she can help–and finally be a part of something, finally fit in. But The Machinist wants to tear Griff’s little company of strays apart, and it isn’t long before trust is tested on all sides. At least Finley knows whose side she’s on–even if it seems no one believes her. 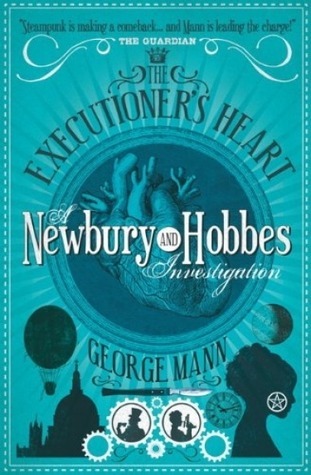 Newbury and Hobbes: The Executioners Heart by George Mann – Goodreads Synopsis: A serial killer is loose on the streets of London, murdering apparently random members of the gentry with violent abandon. The corpses are each found with their chest cavities cracked open and their hearts removed. Charles Bainbridge, Chief Inspector of Scotland Yard, suspects an occult significance to the crimes and brings Newbury and Veronica in to investigate. OOH. This sounds really awesome in a grim, macabre, twisted kind of way. My dad found this on his shelves and gave it to me a few days ago. I found out on Goodreads that it’s the fourth in the series- so I might have to hunt down the other three! (Shout out to anyone who’s read it: Is it possible to read without spoiling the first three?) Either way, it seems great: I love crime fiction and I love steampunk. This is a pretty cool combination for me! 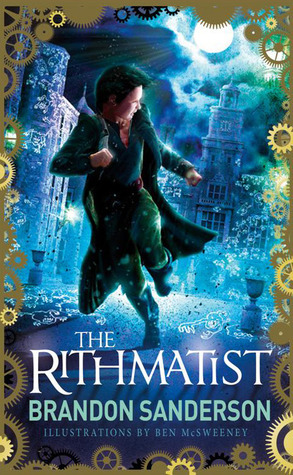 The Rithmatist by Brandon Sanderson – Goodreads Synopsis: More than anything, Joel wants to be a Rithmatist. Chosen by the Master in a mysterious inception ceremony, Rithmatists have the power to infuse life into two-dimensional figures known as Chalklings. Rithmatists are humanity’s only defense against the Wild Chalklings—merciless creatures that leave mangled corpses in their wake. Having nearly overrun the territory of Nebrask, the Wild Chalklings now threaten all of the American Isles. As the son of a lowly chalkmaker at Armedius Academy, Joel can only watch as Rithmatist students study the magical art that he would do anything to practice. Then students start disappearing – kidnapped from their rooms at night, leaving trails of blood. Assigned to help the professor who is investigating the crimes, Joel and his friend Melody find themselves on the trail of an unexpected discovery—one that will change Rithmatics – and their world – forever. This sounds amazing! It keeps catching my eye in bookshops, because of that gorgeous cover. I finally caved in a bought it. I’ve heard great things about it, so hopefully I’ll love it too! It seems like a really original, fun read. This entry was posted in Uncategorized and tagged spotlight on steampunk, steampunk, TBR on December 13, 2013 by keithbwalters. It does look really good! 😀 You must read more steampunk- most of them are so awesome 😀 Thanks Charli! I haven’t read any of these but I quite like the sound of The Executioner’s Heart. Ive heard lots of good things about the Rithmatist too!